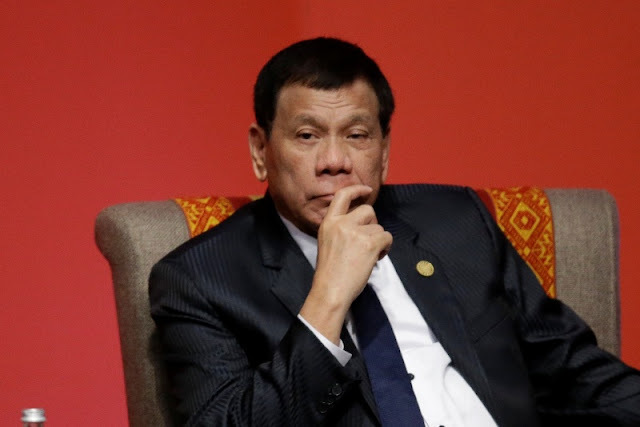 MANILA, July 21 -- Malacañang on Friday brushed off reports that President Rodrigo Duterte is not welcome in the United States, saying that the President has earlier said that he has no plans to visit the US in the first place. "Wala pong plano si Pangulong Duterte na pumuntang Amerika. As a matter of fact, eh abala po si Presidente sa Pilipinas para harapin itong napakaraming issues, problema lalo na itong problema natin sa Maute/ISIS leaning group," Presidential Communications Secretary Martin Andanar said in a television interview. The Palace official said Duterte did not give a specific reason why he does not plan to visit America despite an invitation from President Donald Trump. "Wala namang sinabi si Pangulong Duterte sa amin kung anong dahilan kung bakit wala siyang planong pumunta ng Amerika. Ito ay sa kabila ng imbitasyon ni Pangulong Trump na bumisita ang Presidente at sa palagay ko ito ay dahil na rin sa napakadaming trabaho ang dapat gawin dito sa bansa natin sapagka’t alam mo naman na talagang inikot ni Presidente ang buong ASEAN region. Pumunta ng Peru, pumunta ng Middle East, China at Japan,” Andanar said. The Cabinet official’s statements were made following reports that a US lawmaker has said that Duterte can expect protests from human rights advocates to welcome him if he accepts an invitation from the White House to visit the US. "It was a mistake for our current administration in the United States to extend an invitation to President Duterte here," said US Massachusetts representative James McGovern at a hearing of the Tom Lantos Human Rights Commission in Washington, D.C. on Thursday. McGovern, who co-chairs the commission, said he believes very strongly “that a man with the human rights record of Mr. Duterte should not be invited to the White House,” adding that he would personally lead the protest if the Philippine president goes there. The Tom Lantos Human Rights Commission, a bi-partisan caucus in the US House of Representatives, is currently investigating the "human rights consequences" of the Philippines' war against illegal drugs. Malacañang had earlier said that it expects “due process” to be observed in the panel’s conduct of the investigation. Palace officials stressed that the issues that are the focus of the commission hearing must be discussed in the context of the scope of the challenge that the country faces and the actions that the government is taking to address it. In a Palace briefing Friday, Presidential Spokesperson Ernesto Abella said that it would really help if people listen to both sides of the story. However, he stressed that the real judge of the actions of the administration would be not so much on the opinions of others but actually the people. “At the end, the real judge of the situation would be the people, and who have given him (Duterte) overwhelming support and overwhelming approval. And so, we trust that the people understand that they are really getting the better side of this deal,” Abella said.